Lying at anchor this morning while she waited for the tide to proceed upriver to Glasgow to load scrap, this little ship has Soviet origins. 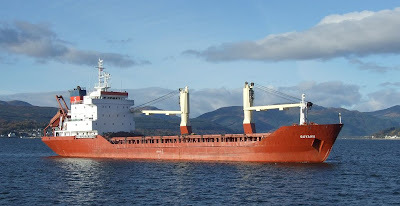 Now named SOYANA, her third name, she was built in 1992 as EKHABI by Turkish builders for Sakhalin Shipping. She was renamed MEKONG QUEST in 1997, then reverted to her original name a year later. In 2000, she became SIDER STAR, then took her present name four years later. Now flying the flag of St Vincent and the Grenadines, she has previously been registered in Portugal and before that, in common with many other Russian ships, in Malta. With an overall length of 97.80 metres, her deadweight is 4,570 tonnes. her current owners are given as Springfield Navigation SA, of the Marshall Islands.